The RMX Series amplifiers give you clean, dynamic power with the legendary QSC sound quality and reliability that pros depend on. The power supply is the heart of an amplifier, converting raw AC power from the wall to clean DC for the audio circuitry. The RMX uses a powerful high-current toroidal transformer and ample filter capacitance to ensure generous energy reserves. This makes a critical difference in sound quality, allowing the amp to effortlessly punch out high level transients, even when driving abusive 2 ohm speaker loads. RMX amplifiers deliver true studio-quality sound. 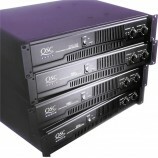 A full complementary output circuit using the highest-grade linear output devices delivers ultra-low distortion. 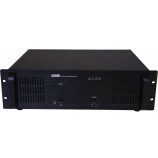 Low-noise variable speed fans with rear-to-front air flow keep amplifiers and racks cool. The SL series of slave amplifier from Clever Acoustics is designed for powering additional zones or for providing extra power within existing installations, and boasts a number of useful features and solid performance.